Get away from it all and spend time reconnecting with Mother Nature during your stay at this cozy cabin in Pollock Pines, California! 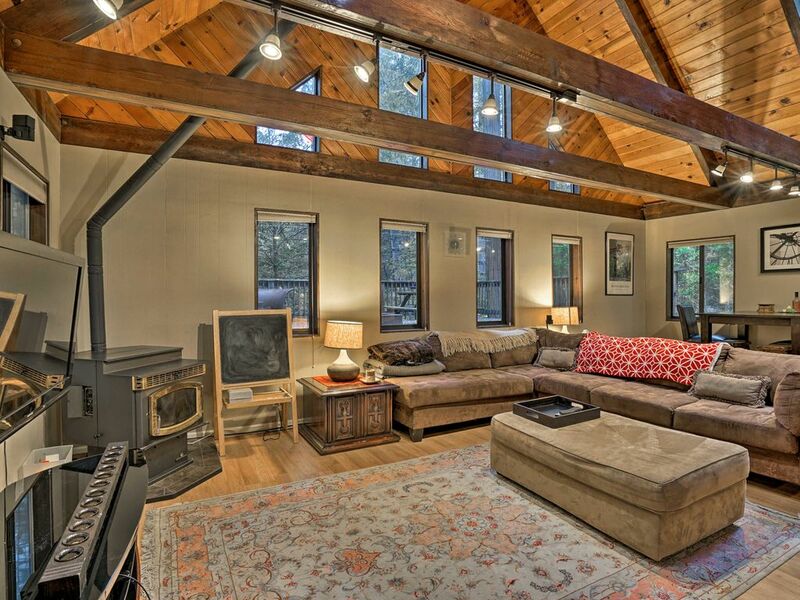 Tucked away in a pine forest, this cabin boasts 1 bedroom, 2 bathrooms, and a loft with a pool table. Groups of up to 5 travelers will love spending days visiting wineries, hanging out at Jenkinson Lake, and exploring nearby Eldorado National Forest! Return from a day of outdoor adventure to relax on the back deck or cozy up inside by the pellet stove. Upon entering the cabin, your eyes will immediately be drawn to the soaring cathedral ceilings with exposed wooden beams. Before you take a seat on the L-shaped couch in the living room, fire up the pellet stove for warmth and ambiance. In addition to providing seating for everyone, the living room hosts a flat-screen cable TV with a Bose surround sound system for all your entertainment needs. When you’re not watching a movie or catching up on your favorite shows, use the free WiFi to surf the net and plan out tomorrow's adventures. The living room flows into the dining area and the fully equipped kitchen, where you can whip up homemade meals and enjoy your culinary creations at the 6-person dining table. Should your recipe call for some grilled meats or veggies, fire up the charcoal grill for an al fresco feast on the spacious back deck. With ample seating and views of towering pine trees, the deck will be your favorite place to start and end your day! Sip your morning coffee while breathing in that fresh pine-scented air, and finish off your evening with a nightcap while you listen to the sounds of the forest. Once day turns to night, make your way back inside and play a friendly game of billiards on the pool table up in the loft! When eyes grow tired, claim one of the 3 beds as your own and drift off into a peaceful slumber. Although this cabin is tucked away in a quiet, forested neighborhood, it’s just minutes from some of Northern California’s top outdoor attractions. Take a short drive to spend a day lakeside at Jenkinson Lake. Whether you’re boating, fishing, or exploring, the lake and Sly Park Recreation Area are both great places to spend the day getting some fresh air with the family! For more water activities, Lake Tahoe is only a 1-hour drive away through the Eldorado National Forest. Rent a boat at the lake for a day on the water or simply catch a tan on one of the sandy beaches. Do you prefer dry land to the lake? You’re in luck! Spend unforgettable days hiking, horseback riding, or mountain biking in the Eldorado National Forest. Don’t forget to bring your camera, as you’re bound to see incredible vistas on your journeys through the forest. The wine lovers in your group won’t want to miss out on a day touring some of the local wineries! Miraflores Winery, diVittorio Winery, Boerger Winery, and many more are all within a stone’s throw of your front door. - Amenities include a fully equipped kitchen, deck with patio furniture and forest views, charcoal grill, pool table, free WiFi, flat-screen cable TV, Bose surround sound system, pellet stove, washer and dryer, driveway parking for 2 vehicles, and much more!